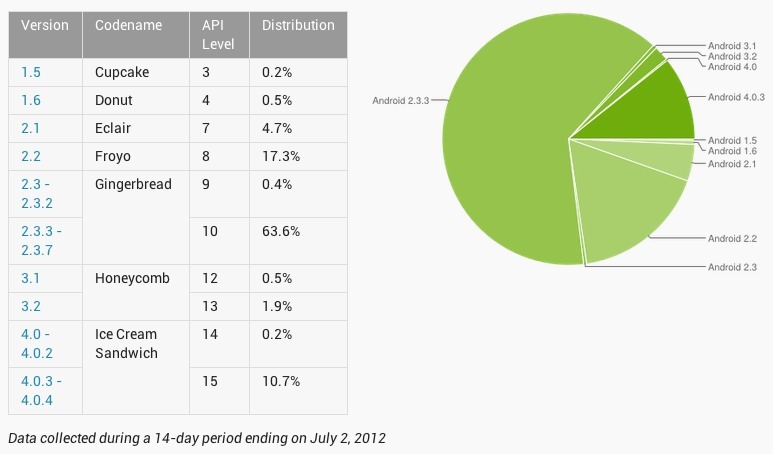 The Android team updated the distribution chart for July and Ice Cream Sandwich numbers look to be growing at a steady rate. Back on May 1, we had ICS on only a low 4.9% of devices, but those numbers have more than doubled, which I’m sure many DROID RAZR and MAXX owners are quite happy with. Gingerbread still leads the pack with an enormous 63.6%, followed next by our beloved Froyo at 17.3%. No mention of Jelly Bean yet on these charts, but that makes sense seeing as how it technically isn’t available yet. We will start to see it grow very slowly by the end of the month once they release it to the AOSP. Reminds me that we are fortunate to have such an awesome community of developers who are already pumping out JB ROM’s for multiple devices. Galaxy S3 Posters Arrive in Verizon Stores, Next Week Launch a Lock?